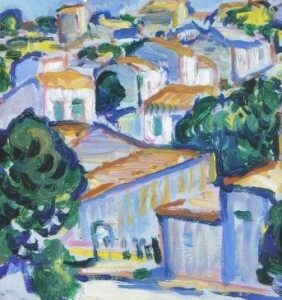 Peploe was the eldest of the four artists popularly known as ‘The Scottish Colourists’. Born in Edinburgh, he was drawn to France and returned to paint there frequently, moving in 1910 to Paris, where he moved in artistic avant-garde circles. His painting style gave way to a more contemporary and expressive approach, and he used rich colours applied with more structured brushstrokes. In 1912 Peploe returned to Edinburgh and slowly began to build a successful career as an exhibiting artist. From around 1914 until his death, he sought to paint the perfect still life. A modest selection of props, including roses or tulips, fans, books, fruits and Chinese vases, were carefully placed in infinite varieties on patterned drapery.